Tab Groups is a brand new add-on for the Firefox web browser that replicates the functionality of Firefox's built-in tab grouping feature. Mozilla announced some time ago that Tab Groups would be one of the features that it would remove from Firefox as part of the organization's "great or dead" project. A core reason for the decision was the feature's low usage numbers, but also that it caused overhead during development as it needed to be adjusted regularly based on changes made to Firefox's core mechanics. Mozilla hoped that add-on developers would re-introduce the feature to Firefox. The first add-on to do that was Simplified Tab Groups which added the core functionality to Firefox but did not replicate the functionality exactly. While it supports the main functionality, that is the creation of different groups of tabs and the ability to switch between those groups, it did not offer the UI that was a major part of the feature in Firefox. 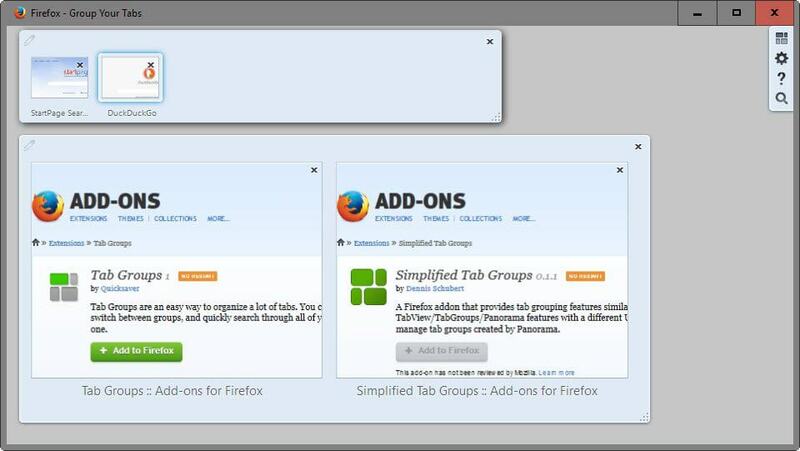 The new Firefox add-on Tab Groups fills that gap as it replicates the functionality exactly. It has been created by Quicksaver, an author responsible for add-ons like FindBar Tweak, OmniSidebar or Beyond Australis. The add-on picks up existing tab groups and takes over flawlessly in the background. This means that you can install it right now to replace the native Firefox implementation without losing any functionality in the process. In fact, it is recommended to do so considering that you may not be able to restore tab groups once Mozilla removes the feature from the web browser. Mozilla plans to migrate tab groups to bookmarks, and to save a backup file to the desktop as well. The Tab Groups add-on is compatible with that backup file which means that you can restore it as long as you have access to that file. The Tab Groups add-on adds a toolbar icon to Firefox that opens a visual representation of all tabs and groups open in Firefox currently. You can drag and drop tabs to groups using it, and switch between groups with a single mouse click. Options to name groups for better recognition are provided as well. New groups are created with a right-click on a tab and the selection of "Move to Group > New Group" from the context menu. There you find options to move tabs between groups directly as well. You may use the keyboard shortcut Ctrl-Shift-E instead to open the Tab Groups interface. The options provide you with the means to change the keyboard shortcut, and to disable the zooming animation. Last but not least, a backup and restore function has been implemented on the options page on top of that which you can use for safe-keeping. Tab Groups is the real deal. It replicates Firefox's Panorama functionality, takes over without you noticing that it does, and can even load the backup file created by the browser when the native tab grouping feature is dropped. If you use Tab Groups currently and want to continue using the feature, this is the add-on you need to get for that.